My kids started school this week, and with it, I&apos;m thrown back into daily lunch-packing duty. 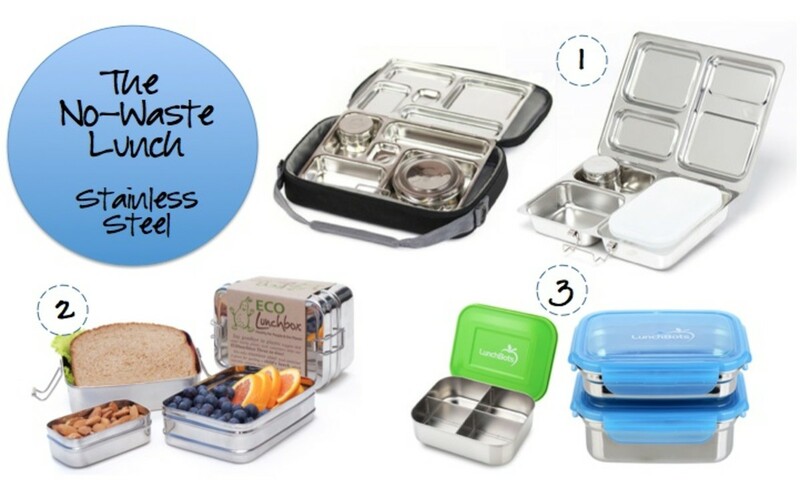 I like to keep things on the green side when I can, so today I&apos;m giving you a round-up of some of my favorite no-waste* lunch boxes and containers in stainless steel and plastic for back-to-school lunches. I love stainless steel containers that don&apos;t absorb odors or colors, are durable, and are dishwasher-safe. One of my current favorites is the multi-compartment containers by Planetbox (1). I love that there&apos;s only one thing to clean, no lid to lose, and that my son can see all of the items in his lunch at once. The Rover (top left) is good for younger kids or those who like lots of different nibbles and the Launch (top right) is great for older kids and adults since it can fit a whole sandwich, salad or larger entrée portion. It&apos;s an investment, but we&apos;re on our third year of using our Rover and it&apos;s still going strong. ECOlunchbox (2) makes lots of different stainless steel containers, but I&apos;m partial to their 3-in-1 set that lets you easily pack a sandwich and two sides. A bonus - storing them between uses is no hassle since the containers are nesting. The clips may be a little tough for young children, but ECOlunchbox says you can adjust the tightness of the clips with pliers. And at $25, ECOlunchbox is an affordable stainless steel options. LunchBots (3) has variety stainless steel containers including the Uno, Duo, Trio and Quad, but I like that they also offer a selection of leak-proof containers to keep your salad dressing, sauce or fruit salad spill-free. Another favorite of my family is EasyLunchBoxes (4). I&apos;ve had our set for at least two years and they look as good as new. Each $14.95 set comes with four plastic containers that are BPA, PVC and phthalate-free. They can be used in the freezer or microwave and washed in the dishwasher. The lunch bag (sold separately) is a little large for my taste - though it does definitely have room for one of the filled containers, a whole fruit, drink and separate snack. But I LOVE that the lunch bag can hold three fully filled containers - perfect when I take my three kids to the park or to childcare at my gym. Laptop Lunches (5) has been around for more than a decade and was one of the first major companies I remember bringing the bento-style lunch box idea to the mass market. They sell all their components separately, but their Bento Kit include a lunch bag, bento box with 5 containers, and stainless steel spoon and fork. For kids, be sure to choose the kit that has a handled lunch bag for easy transport. Also be sure to check out their extensive list of menu ideas. I saw these On Safari bento boxes (6) by Green Sprout recently and just fell in love with how adorable they are. They are on the small size (6" x 4.5" x 2.75") making them perfect for preschool and kindy. Each locking box has a large compartment on the bottom and a removable nesting tray with two compartments that sits on top. The dual latches are easy for little hands to open and the kits come in Croc, Hippo, Monkey, Lion or Elephant. And they are only $7.99! The only downsides are that they don&apos;t have a handle and aren&apos;t insulated. We&apos;ve also been trying out the Spencer Clear Food Storage Set (7) by Pottery Barn Kids. This four-pack of containers is BPA and phthalate free, top rack dishwasher-safe and comes with lids that are secure enough to hold lunch in without being too tricky for little hands to get off. The set works with any of PBK&apos;s Mackenzie lunch bags which come in a variety of prints and four different sizes - Classic, Sack, Retro and Dual. One of my favorite features is that the smallest container can be used on its own for nuts or animal crackers or stored inside one of the bigger container to hold hummus or yogurt dip. What are you packing school lunches in for your kids? 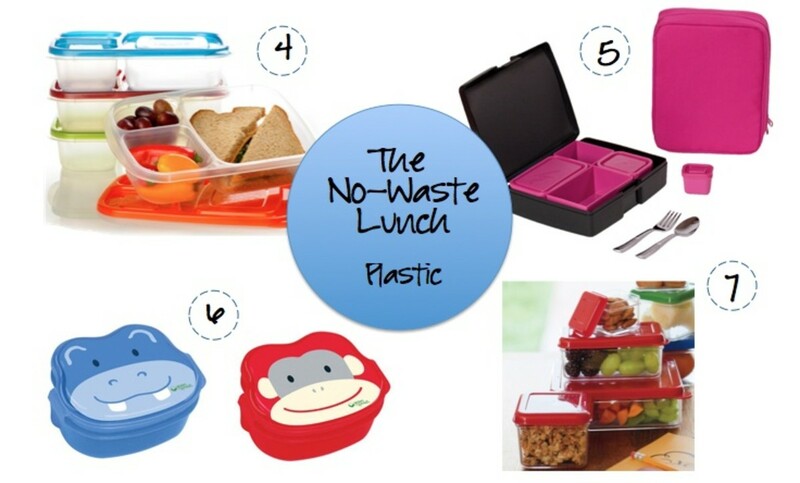 Have a favorite no-waste lunch system? Tell us in the comments below! Samples of some of the products were provided for review purposes.